Scientists from the Chinese Academy of Sciences in collaboration with the University of Alberta, have announced the discovery of a new Therizinosaur based on fragmentary fossils from the Lower Cretaceous Jehol Group of Liaoning Province (north-eastern China). This is the third Therizinosaur to have been named from the Jehol Group, joining Jianchangosaurus and Beipiaosaurus. These dinosaurs are approximately the same size, the researchers have put forward a number of theories to help explain why three similar-sized members of the Therizinosauridae could have potentially co-existed without directly competing. The dinosaur has been named Lingyuanosaurus sihedangensis (pronounced: ling-you-an-oh-sore-us), the genus name honours the city of Lingyuan, whilst the trivial epithet refers to the town of Sihedang where the fossils were discovered. The picture above shows some of the fossils used to name and describe this new species of dinosaur. Top left (a), limb bones consisting of a right femur and left tibia, whereas, (b) contains ribs, part of the right humerus and the ischium. Slab (c) consists of claw bones (manual unguals) and ribs, whilst (d), shows the right ankle bone (astragalus) and the left ilium. Note the scale bar equals 5 cm. Described from a single, disarticulated but associated partial skeleton, the exact age of the fossils is disputed. The fossil-bearing strata at Sihedang have been assigned to the Yixian Formation in some studies but to the younger Jiufotang Formation in others. A phylogenetic analysis carried out by the authors places Lingyuanosaurus in an intermediate position within Therizinosauria. It has been placed between the early-branching Therizinosaurs such as Falcarius, Jianchangosaurus, and Beipiaosaurus and the late-branching ones such as Alxasaurus and Therizinosaurus. Lingyuanosaurus sheds additional light on the evolution of major Therizinosaurian characteristics, including the distinctive pelvic girdle and hindlimb morphology seen in this group. 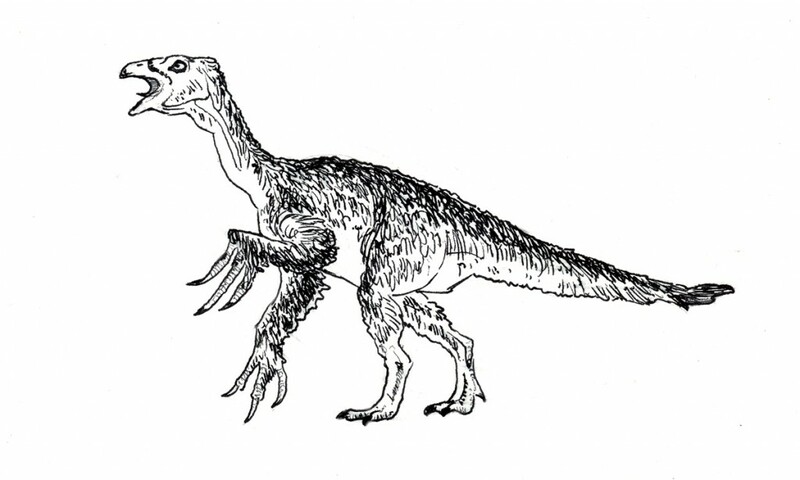 A drawing of a typical Therizinosaur. Where Did Lingyuanosaurus Fit into the Jehol Biota? Measuring around two metres in length, this is the third similar-sized Therizinosaur to be assigned to this Early Cretaceous biota of northern China. The presence of three very similar types of dinosaur in the Jehol Group is unusual. Unless the region was particularly rich in resources, these dinosaurs could have been in direct competition with each other. The researchers put forward several possible explanations as to why three similar Therizinosaurs have been identified. Firstly, the beds in which these Therizinosaurs (Jianchangosaurus, Lingyuanosaurus and Beipiaosaurus), have been found are not precisely dated. The Yixian and the Jiufotang Formations were deposited over a span of at least 8 million years. 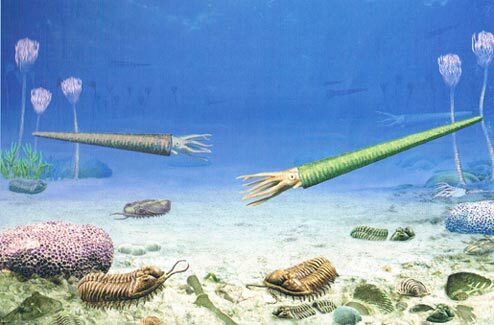 It is possibly that these three dinosaurs could have been separated from each other by a considerable period of time, hundreds of thousands or even millions of years. Secondly, these three species are known from different parts of Liaoning Province. Whereas, Jianchangosaurus and Lingyuanosaurus were found at sites just a few miles apart, Beipiaosaurus heralds from more than 200 miles further north. There is some, albeit limited, evidence to suggest that during the Early Cretaceous the deposition of the Jehol Group occurred in multiple small basins, suggesting that the three Jehol Therizinosaurs might have been separated by geographic barriers even if they were mutually contemporaneous. Thirdly, if these three Therizinosaurs did live at the same time, in the same habitat, they might have occupied different niches in the ecosystem. The teeth of Jianchangosaurus are different (although the holotype represents a juvenile, so comparison with fully grown animals can be problematic), this suggests that Jianchangosaurus might have fed on different types of vegetation compared to Lingyuanosaurus and Beipiaosaurus. In addition, the ratio of limb bones in Beipiaosaurus is different to the other two dinosaurs, it might have been relatively slow in comparison with Jianchangosaurus and Lingyuanosaurus and therefore it could have had a more limited range. Claw fossils of Lingyuanosaurus (manual unguals). Over the last thirty years or so, our understanding of the evolution of the human family tree has moved on considerably. Ironically, it is not so much the discovery of new fossils that have helped to fill in the significant gaps in our knowledge, although recent discoveries, most notably in South Africa have helped to improve our understanding. Advances in our understanding of the genome of our own and closely related species such as the Neanderthal can perhaps be cited as having the greatest impact. However, our family tree is far from understood and a new paper, published in the journal “Nature” this week, only demonstrates how much more we have to learn. Indeed, the human family tree has another branch, step forward Homo luzonensis from Luzon Island in the Philippines. This hominin may have been small in stature, but this is big news for anthropologists. Professor Piper (Australian National University), holding a cast of a toe bone assigned to H. luzonensis. The picture (above) shows Professor Philip Piper (School of Archaeology and Anthropology, Australian National University), holding the cast of a hominin third metatarsal (toe bone). The fossil was found in 2007 in the Callao Cave system (northern Luzon, Philippines) and dated to 67,000 years ago. Ascribed to the genus Homo, it provided the earliest direct evidence of a human presence in the Philippines archipelago, but to which species did this toe bone belong? Researchers from the National Museum of Natural History (Paris), Bordeaux University and the University of Poitiers, along with colleagues from the Griffith University and the Australian National University were led by Dr Armand Mijares (University of the Philippines). During the excavations at the Callao Cave site, a total of thirteen fossil specimens were found relating to humans, teeth, foot, finger and hand bones as well as a partial femur. The scientists have concluded that the material represents at least three individuals. The finger and toe bones are curved, suggesting that climbing was still an important activity for this human species. Homo luzonensis fossil digits and toes indicate that tree climbing was very important to this human species. Commenting on the importance of these fossils, Professor Piper stated that this discovery represents a major breakthrough in our understanding of human evolution across south-eastern Asia. The researchers conclude that the hands and feet are reminiscent of the hands and feet of Australopithecines. The Australopithecines are considered to be the ancestors of the Homo genus, which includes our own species – H. sapiens. The latest branch to the human family tree is posing a number of intriguing questions to palaeoanthropologists. Did these primitive anatomical features result in this species of hominin due to adapting to an island life, after all Luzon was heavily forested, or are these traits resulting from primitive African hominins migrating to south-east Asia? Excavations at the Callao Cave complex. Recent excavations near the Callao Cave complex have produced evidence of a butchered rhinoceros and many types of stone stool, some of which have been dated to around 700,000 years ago. The teeth are quite small and helped to support the erection of a new species. The identification of a new species of human in the Philippines makes the whole of south-east Asia very significant. The Philippines is made up of many thousands of islands, it is possible that other islands may have had hominin populations that could be described as a new species, indeed, within the archipelago there could be evidence for several species of hominin. For example, stone tools dating to around 200,000 years ago have been found on the Indonesian island of Sulawesi. This suggests that ancient members of the human family tree may have inhabited many of the larger islands in south-east Asia. Scientists are aware that south-eastern Asia was home to another species of human, the enigmatic Denisovans, which are known from just a handful of fossil bones found in the mountains of Siberia, but DNA studies have revealed that the Denisovans interbred with early modern humans in this region. No fossil remains relating to the Denisovans have been found in south-eastern Asia thus far. In addition, the Indonesian island of Flores was home to a hominin species (Homo floresiensis). These diminutive people, nicknamed Hobbits because the scientific paper was published at the height of the interest in the “Lord of the Rings” film trilogy, are thought to have lived as recently as 50,000 years ago. An article on Homo floresiensis: Did Modern Humans Drive the Hobbit (H. floresiensis) to extinction? Intriguingly, anthropologists have argued that H. floresiensis exhibits physical features that are reminiscent of those found in Australopithecines. However, other researchers have argued that the Hobbits were descended from Homo erectus but that some of their anatomy reverted to a more primitive state, perhaps as a result of living on an island with limited resources. For an article that discusses the significance of south-east Asia in human evolution: Did Humans Evolve Independently in Asia? Regular visitors to Everything Dinosaur’s main website (Everything Dinosaur), will notice some subtle changes to the theme and the website’s framework. Customers can still expect our award winning 5-star service, that has not changed, nor have we reduced the range of dinosaur and prehistoric themed products that we stock, however, our use of sliders and animation has been reduced to help maintain fast page load times when our site is viewed on mobiles and other devices. Dinosaur workshops in schools, Everything Dinosaur offers dinosaur and fossil workshops in schools. Team members at Everything Dinosaur are constantly working to improve and enhance the experience visitors and customers have when they visit our websites. Making such improvements are part of a long-term and on-going programme of investment to help this UK-based company stay ahead of the curve when it comes to technical developments. After all, with our knowledge of the Dinosauria, we don’t want Everything Dinosaur going extinct! The changes we have made will have no bearing on how the site is viewed. It will have no impact on the site pages, all the customer benefits are retained, the changes just permit those visitors using mobiles and other devices (not viewing the site from a personal computer), to have slightly quicker load times, for the pages that they wish to view or the landing pages that they are directed to. New slides helping to promote the Eofauna Scientific Research prehistoric animal models and figures. The functionality of the website will not be affected by these changes. The front page of our website will continue to inform visitors about new arrivals/new products and the Feefo ratings along with the chat live options will continue to be prominently displayed. The “contact us” email link will still be accessible, but in the near future another, additional “contact us” link will be provided nearer the top of the page, just for customer convenience. New Kaiyodo Sofubi Toy Box T. rex models feature in the first of our new promotional slides. Just like when writing a scientific paper or report, the work done so far is part of a continuing process. As with science, things move on and the Everything Dinosaur websites are constantly being reviewed and updated to meet the changing needs of the market place. Everything Dinosaur team members have set aside much of the time this week to schedule some adjustments and improvements to the company’s website. Some minor changes are being made to the way in which pictures are being uploaded onto the site, these alterations are part of Everything Dinosaur’s on-going plans for continuous improvement and customers will not notice any difference in the operation of our various platforms. As part of the changes, some of the visuals have been updated to include images of recently introduced or items that are being introduced in the very near future. Updating the learning category at Everything Dinosaur. Changes are being made to some visuals and images to further improve the experience of visitors and customers. The Everything Dinosaur website is being constantly examined and analysed in order to detect areas where improvements can be made. Our aim is to build a culture of continuous improvement and these goals and aims are reflected in the way in which we try to maintain and develop our on-line presence. All team members have a role to play in helping to develop continuous improvement. Take for example, some of the visuals that we use to promote various categories and sub-categories of products. These are updated and refreshed in order to reflect the latest additions to our product range. Updating the Papo figures and models category. As part of our revision of the images we use on the website, the visual associated with the Papo website has been updated to include the recently introduced brown, running Tyrannosaurus rex figure. The image also depicts the Papo Pentaceratops and the Gorgosaurus, both models are due to in stock later on this year (summer 2019). In addition to the Papo category being adjusted, other model categories have been revamped too. Take for example, the Wild Safari Prehistoric World range of prehistoric animal models and figures. Virtually all of the new for 2019 models are already in stock at Everything Dinosaur, but plans are well advanced to receive the last of this year’s new models – the Wild Safari Prehistoric World Allosaurus. As a result, the visual used to promote this sub-category has also been revised. The new Allosaurus model has been added to this image. Updating the Safari Ltd figures and models category.